Lee is a county in Mississippi. As of the 2010 census, the population was 82,910. The county seat is Tupelo. Lee County is included in the Tupelo Micropolitan Statistical Area. 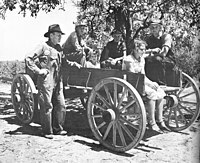 Family in a wagon, Lee County, August 1935, Arthur Rothstein. Lee County was established on October 26, 1866, and named for Robert E. Lee, General in Chief of the Armies of the Confederate States. It was carved from Itawamba and Pontotoc; therefore, the record and list of pioneers mentioned in those counties embrace a great number who were residents of what is now Lee. According to the U.S. Census Bureau, the county has a total area of 453 square miles (1,170 km2), of which 450 square miles (1,200 km2) is land and 3.2 square miles (8.3 km2) (0.7%) is water. As of the census of 2000, there were 75,755 people, 29,200 households, and 20,819 families residing in the county. The population density was 168 people per square mile (65/km²). There were 31,887 housing units at an average density of 71 per square mile (27/km²). The racial makeup of the county was 73.66% White, 24.51% Black or African American, 0.13% Native American, 0.52% Asian, 0.01% Pacific Islander, 0.43% from other races, and 0.74% from two or more races. 1.16% of the population were Hispanic or Latino of any race. There were 29,200 households out of which 36.10% had children under the age of 18 living with them, 52.60% were married couples living together, 14.60% had a female householder with no husband present, and 28.70% were non-families. 25.00% of all households were made up of individuals and 8.50% had someone living alone who was 65 years of age or older. The average household size was 2.55 and the average family size was 3.05. In the county, the population was spread out with 27.70% under the age of 18, 8.50% from 18 to 24, 30.50% from 25 to 44, 21.80% from 45 to 64, and 11.50% who were 65 years of age or older. The median age was 35 years. For every 100 females, there were 92.30 males. For every 100 females age 18 and over, there were 87.50 males. The median income for a household in the county was $36,165, and the median income for a family was $43,149. Males had a median income of $31,039 versus $22,235 for females. The per capita income for the county was $18,956. About 10.50% of families and 13.40% of the population were below the poverty line, including 17.90% of those under age 18 and 15.50% of those age 65 or over. Lee County has the ninth highest per capita income in the State of Mississippi. Lee County is served by the Baldwyn, Lee County, Nettleton, and Tupelo school districts. ^ a b "State & County QuickFacts". United States Census Bureau. Archived from the original on July 13, 2011. Retrieved September 4, 2013. ^ Gannett, Henry (1905). The Origin of Certain Place Names in the United States (Report). U.S. Geological survey. Bulletin no. 258 (2nd ed.). Washington: Government Printing Office. p. 184. LCCN 05000751. OCLC 1156805 – via United States Geological Survey. ^ Lowry, Robert; McCardle, William H. (1891). A History of Mississippi, From the Discovery of the Great River by Hernando De Soto, Including the Earliest Settlement Made by the French, Under Iberville, to the Death of Jefferson Davis. Jackson, Miss. : R. H. Henry & Co. p. 520. LCCN 01002485. OCLC 2109804. OL 271554M. ^ "QuickFacts. Lee County, Mississippi". United States Census Bureau. Retrieved November 27, 2018. ^ Leip, David. "Dave Leip's Atlas of U.S. Presidential Elections". uselectionatlas.org. Retrieved March 5, 2018.